To the ground chicken, add the chili powder, cilantro & grill seasoning. Shape into 3 burgers.To the ground beef, add the chili powder, cumin & thyme. Shape into 3 burgers. Prepare burger buns as desired and top with burgers, cheese, bacon and your desired condiments, such as mayonnaise, lettuce, tomato and onion. Chicken fajita burgers? Yuss please! I love (and prefer) chicken burgers too. These looks so delicious. 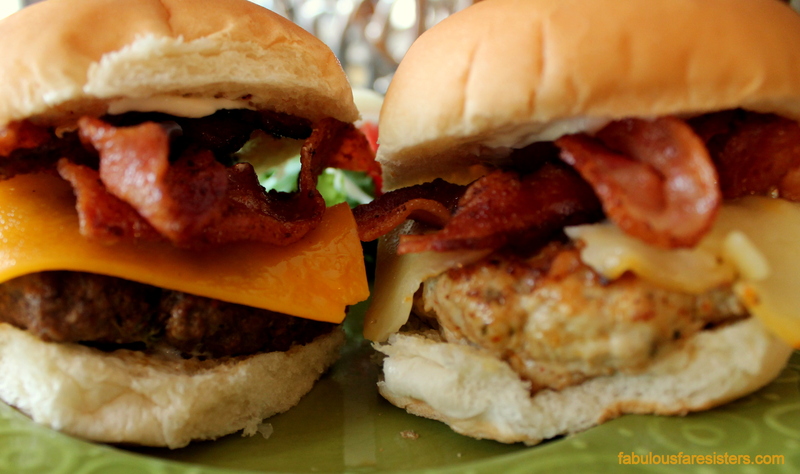 OH MY….those burgers look AMAZING!!! They tasted amazing too…especially the chicken burger! !